One of the oldest texts on Yoga, the Yogayajnavalikya Samhita is a dialogue between the great sage Yajnavalkya and his learned wife Gargi. Considered as one of the most learned women of all times, Gargi poses questions to her husband, on how to reach the highest. Yajnavalkya shows her the way patiently and systematically, through the twelve chapters of this work. The form of a dialogue between the two presents a rich teaching in a very engaging manner. The work presents a lot of unique ideas that can be found in no other text, as well as certain ideas that are different from the more popular yoga texts. This is the first time this composition is being translated into English. There was no complete manuscript available for a long time, and only two versions were available that were nearly complete. Thanks to the efforts of Sri T Krishnamacharya, the greatest yogi of the last century, this translation has been possible. As there was no manuscript that was both complete and accurate, he wrote the entire manuscript by hand and taught his son and student TKV Desikachar. He even corrected and filled up the gaps of the manuscripts that were available those days. This English translation by TKV Desikachar, is based on his father's notes. The text is in poem form and hence the translation is not word to word. In places where a group of sloka-s-s have to be combined to have the complete meaning, it has been done so. Similarly in places where the sloka-s need to be divided, and grouped with the previous or the following ones, it has been done so. This has contributed towards the easy understanding of the text. 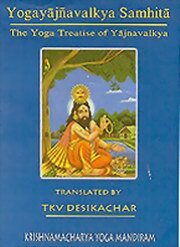 TKV Desikachar, one of the most renowned authorities on yoga presents this book with two of his students Kausthub Desikachar and Frans Moors. In addition to years of yoga training from his father, TKV Desikachar holds a degree in structural engineering. Since the 1960s he has devoted himself to yoga instruction for people from all walks of life and with all kinds of abilities; among his students was the renowned philosopher J Krishnamurti. Desikacher continued to live and study with his father until Krishnamacharya’s death in 1989. One of the world’s foremost teachers of yoga, Desikachar currently teaches at the school founded in his father’s memory in Madras, as well as in Europe, the United States, Australia, and New Zealand. This is one of the best traditional yoga texts available. It goes back to one of the main Upanishads and gives clear instruction on the path of Yoga. This text includes valuable discussion of the Vayus and important related Ayurvedic topics related to yoga as well. I would recommend this book right up there with the Yoga Sutras of Patanjali!!!! This is one of the best traditional yoga texts available. It ..